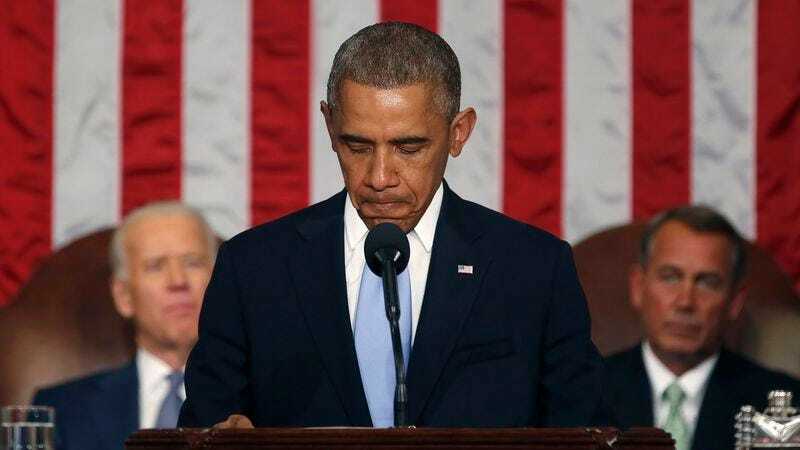 WASHINGTON—Providing Americans with an honest preview of his agenda for 2015, President Obama delivered a brief State of the Union address Tuesday night, which consisted solely of him listing off 35 initiatives that he acknowledged will never be approved by Congress. Obama, who approached the House of Representatives rostrum without greeting or shaking hands with any of the numerous political leaders in attendance, began the two-and-a-half-minute speech to the nation by muttering, “Let’s get this over with,” before reading off the bulleted list of proposals one by one. According to onlookers, the president maintained a steady and deliberate pace throughout the speech, regularly talking over his audience’s attempts at applause as he sought to work through the inventory of unattainable legislative goals as fast as possible. In addition to staring fixedly downward at his notes for the duration of his address, Obama was seen taking each page of his speech as he completed it and placing it in a wastebasket to the left side of his lectern. Sources confirmed that the president halted only once during the speech in order to take a breath before continuing with his rundown of soon-to-be-rejected plans.